I choose this set because I purchased pictures that were really blue on a white background and white frame. This really added color to my neutral wall. Turned out great. Elegantly update your bedroom with the Madison Park Belle 7 Piece Comforter Set. A beautifully embroidered floral pattern is showcased on the faux silk comforter. The pieced design, in aqua, green, and grey hues, adds a lovely contrast and texture to the ensemble. A solid aqua bed skirt gracefully complements the enticing design seen on the top of the comforter. Matching shams bring the unique style of the comforter to the head of the bed, giving it a truly luxurious look. Three decorative pillows with intricate embroidery, pleating, and piecing, complete this exquisite comforter set. My Mother purchased This Comforter Set in Queen Size for new bedroom furniture. Unfortunately, when it was delivered the box Was Opened sitting on my porch in the rain.She contacted Overstock and they signed her up for their reward program for free&amp; credited her account for maybe $20. Now, After Less Than 6 months of Extremely Light use since it's only been Washed 1 time&amp; I Remove the comforter to the bottom of bed a night(Folded down) I Use a Nice,Soft Blanket &amp; this was for Decoration. I Followed All Instructions (Washed Delicate&amp; dried on low setting, Now it could fit a Full Size Bed! It Can &amp; Will Shrink. I Totally Regret This Purchase. I Don't recommend purchasing it. Extremely disappointed that it was ordered back in Mid March But didn't start using it until late April (When I received it since it was a Gift. The threads have come undone at the bottom where the main pattern is at too. Buyer Beware on this one b.c a return isn't possible. I can only include 3 pictures of how short it is now too.It's Wrinkled Terrible &amp; The Inside Stuffing Of The Comforter is Bunched up in a Ball (at The Bottom of comforter) Shown in one picture.Buyer Beware on this one b.c a return isn't possible now. This Was Definitely Money Wasted &amp; This Was Our First Purchase at Overstock &amp; Should've Returned it After the Poor Packaging and not learn the hard way. I've Had Comforters Last For Yrs before changing decor But this has had maybe 5 months of light use and with one wash it's getting Bagged up &amp; Having to Search for a new one. I was very pleased when I opened the box and the Comforter set was exactly what I saw on line! It is so beautiful! I bought it for my sister in law's birthday, as she has a tendency to stick to one color theme. I just broke that with this beautiful set! 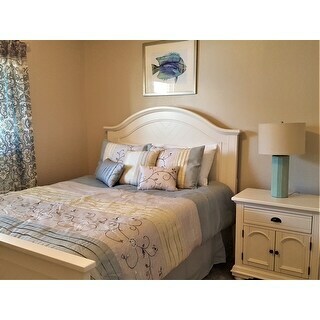 Madison Park Bella Aqua 7 Piece Embroidered Comforter set is worth every cent spent. Beautiful! This comforter set is so pretty with soft spa-like colors. It makes my guest room look inviting and put together. I absolutely love this beautiful comforter set. The colors are like diving into an inviting pool of serenity. Fit is perfect on my King size bed. It feels like I am sleeping in a billow of silk. The flowers are so beautiful the pillows are purr-fect! Thank you for this lovely set. Five stars!! I love this comforter. Looks nice. 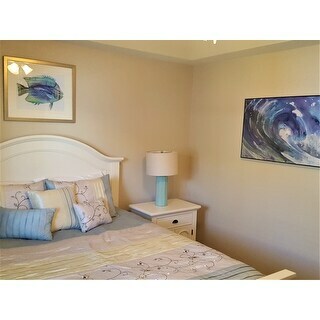 The color of the comforter set is true to the picture. I really like the colors! Seemed to have some threads that came apart after a few washes but over all a good product. Beautiful colors and excellent quality. The colors are soft and relaxing. Bought for a seaside vacation rental home. The aqua color is true...the accent color is more of a lemon-lime color. The colors compliment each other well. This set is very pretty. The colors and the pattern are beautiful. It adds a dressiness to the guest bedroom. This bedding ensemble gives my Master Bedroom a "Polished " look. The neutral color warms the room. Used for 1 yr. . Material not for a bed made daily. Shredding on pillow seems. I love this set it is so beautiful in person! It is beautiful but it has some fraying on the pillow. "Are there any matching Euro Shams for this product?" It reminds me of a lovely quilt set that I used to have that got burned on one end from the dryer. I will hang dry this beauty. I love the silk look and feel. Can't wait to put this cool pool of blue into my bedroom. "My bedroom walls are a light taupe. 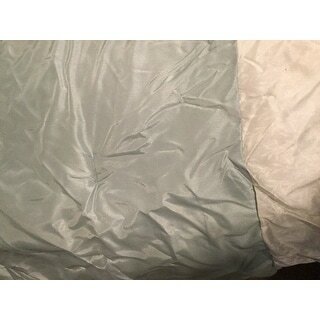 Will the gray in this comforter clash with the taupe?" "Does this comforter wrinkle easily? I fold it down to bottom of bed at night." No. Love it. I don't leave at bottom of bed. Light enough to fold in half at bottom of bed and place in a ** luggage / spread holder. Pleasant soft colours. "Are there curtains and/or drapes available to match this comforter?" There is matching drape with this colorway. SKU 17924352. We are temporarily out of stock until early July for aqua colorway. Or 17226346 Aqua/brown embroidery which is in stock now.